UK prison review reveals top officials gave approval to Muslim inmates to raise money for a Hamas front. An official investigation of Islamist radicalization in UK jails has revealed that the senior level of the prison service approved having Muslim prisoners fundraise for a problematic organization, which is funding Hamas terror attacks against Israel. Muslims jailed in at least four prisons were encouraged by Muslim chaplains to take part in sponsored fundraising activities for the terror-related group, according to the official probe that found top-level failings at the National Offender Management Service (Noms). 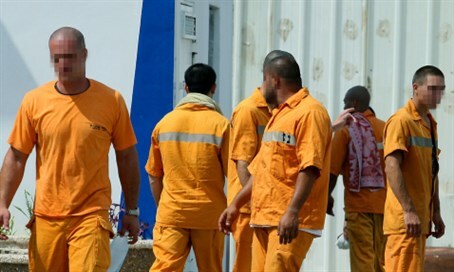 The groups that prisoners were allowed to raise funds for included an organization connected with Interpal, a UK charity allowed in Britain but banned in the US and Israel for its funding of the Hamas terrorist organization, reports The Times on Wednesday. Just last year the UK government named Interpal as being involved in a secretive network of Islamist groups that provide support for the Muslim Brotherhood and its Gazan offshoot Hamas from within the UK. Wednesday's revelation regarding Interpal comes a day after The Times reported that Muslim chaplains appointed by the state at over ten prisons have been distributing extremist literature, which among other things encourages the murder of apostates. The report on Noms has yet to be fully released, but the findings apparently indicate that loose standards within the prison service have turned jails into centers of Islamist indoctrination. Those failings are indicated by the fact that senior prison figures approved the organization linked to Interpal as a good cause for prisoners to raise money for, despite its funding of Hamas terror. One particular figure who has had concerns raised about him in the investigation is Ahtsham Ali, an official overseeing the appointment of Muslim prison chaplains and advising on counter-radicalization in the jails. Ali previously was a senior leader in UK Muslim organizations closely connected to Jamaat-e-Islami, which the UK government last year identified as an offshoot of the Muslim Brotherhood in Pakistan. Ali's association with the groups has reportedly led to an investigation against him.